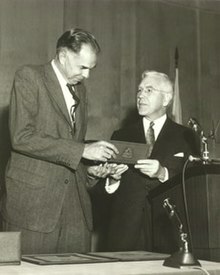 AEC chair John A. McCone presents the Enrico Fermi Award to Glenn T. Seaborg in 1959. 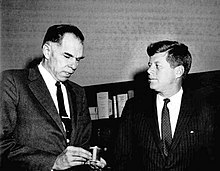 Seaborg succeeded McCone as AEC chair in 1961. An increasing number of critics during the 1960s charged that the AEC's regulations were insufficiently rigorous in several important areas, including radiation protection standards, nuclear reactor safety, plant siting, and environmental protection. By 1974, the AEC's regulatory programs had come under such strong attack that the U.S. Congress decided to abolish the AEC. The AEC was abolished by the Energy Reorganization Act of 1974, which assigned its functions to two new agencies: the Energy Research and Development Administration and the Nuclear Regulatory Commission. On August 4, 1977, President Jimmy Carter signed into law The Department of Energy Organization Act of 1977, which created the Department of Energy. The new agency assumed the responsibilities of the Federal Energy Administration (FEA), the Energy Research and Development Administration (ERDA), the Federal Power Commission (FPC), and various other Federal agencies. Because of the need for great security, all production facilities and nuclear reactors would be government-owned, while all technical information and research results would be under AEC control. The National Laboratory system was established from the facilities created under the Manhattan Project. Argonne National Laboratory was one of the first laboratories authorized under this legislation as a contractor-operated facility dedicated to fulfilling the new AEC's missions. the Argonne was the first of the regional laboratories, to involve universities in the Chicago area. Others were the Clinton (CEW) labs and the Brookhaven National Laboratory in the Northeast, although a similar lab in Southern California did not eventuate. On 11 March 1948 Lilienthal and Kenneth Nichols were summoned to the White House where Truman told them "I know you two hate each other’s guts". He directed that "the primary objective of the AEC was to develop and produce atomic weapons", Nichols was appointed a major general and replaced Leslie Groves as chief of the Armed Forces Special Weapons Project (AFSWP), previously Lilienthal had opposed his appointment. Lilienthal was told to "forgo your desire to place a bottle of milk on every doorstop and get down to the business of producing atomic weapons. 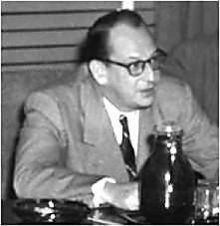 Nichols became General Manager of the AEC on 2 November 1953. The AEC was in charge of developing the U.S. nuclear arsenal, taking over these responsibilities from the wartime Manhattan Project. In its first decade, the AEC oversaw the operation of Los Alamos Scientific Laboratory, devoted primarily to weapons development, and in 1952, the creation of new second weapons laboratory in California, the Lawrence Livermore National Laboratory. The AEC also carried out the "crash program" to develop the hydrogen bomb (H-bomb), and the AEC played a key role in the prosecution of the Rosenbergs for espionage. The AEC also began a program of regular nuclear weapons testing, both in the faraway Pacific Proving Grounds and at the Nevada Test Site in the western United States. While the AEC also supported much basic research, the vast majority of its early budget was devoted to nuclear weapons development and production. Within the AEC, high-level scientific and technical advice was provided by the General Advisory Committee, originally headed by J. Robert Oppenheimer. In its early years, the General Advisory Committee (GAC) made a number of controversial decisions, notably its decision against building the hydrogen bomb (H-bomb), announced in 1949. As a result, U.S. Senator Brien McMahon prompted the decision not to reappoint J. Robert Oppenheimer to the GAC when his six-year statutory term expired in 1952. David Lilienthal, the AEC chairman, agreed with Oppenheimer, and he also opposed "a crash program to build the hydrogen bomb ahead of any other nation." 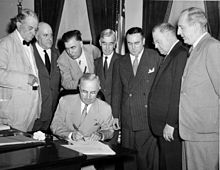 Then President Truman asked Lilienthal to leave the AEC, and he did so on February 15, 1950. Lilienthal had been one of the original members of the AEC who granted Dr. Oppenheimer nuclear security clearances in 1947. With Oppenheimer and Lilienthal removed, President Truman announced his decision to develop and produce the hydrogen bomb. The first test firing of an experimental H-bomb ("Ivy Mike") was carried out in the Central Pacific on November 1, 1952, under President Truman. Furthermore, U.S. Navy Admiral Lewis. 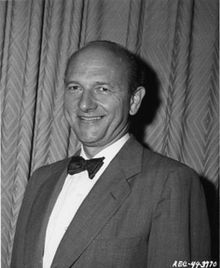 W. Strauss was appointed in 1953 by the new President Eisenhower as the Chairman of the AEC, to carry out the military development and production of the H-bomb. Lilienthal wanted to give high priority to peaceful uses, especially with nuclear power plants. However, coal was still cheap, and the electric power industry was not interested. The first experimental nuclear power plant was started in Pennsylvania under President Eisenhower in 1954. The AEC was connected with the U.S. Department of Defense by a "Military Liaison Committee"'. The Joint Committee on Atomic Energy exercised congressional oversight over the AEC and had considerable power in influencing AEC decisions and policy. The AEC's far-reaching powers and control over a subject matter which had far-reaching social, public health, and military implications made it an extremely controversial organization. One of the drafters of the McMahon Act, James R. Newman, famously concluded that the bill made "the field of atomic energy [an] island of socialism in the midst of a free-enterprise economy". By 1974, the AEC's regulatory programs had come under such strong attack that Congress decided to abolish the agency. Supporters and critics of nuclear power agreed that the promotional and regulatory duties of the AEC should be assigned to different agencies. The Energy Reorganization Act of 1974 transferred the regulatory functions of the AEC to the new Nuclear Regulatory Commission (NRC), which began operations on January 19, 1975. Promotional functions went to the Energy Research and Development Administration which was later incorporated into the United States Department of Energy. Lasting through the mid-1970s, the AEC and the Manhattan Project carried out human radiation experiments. The government covered up most of these radiation mishaps until 1993, when President Bill Clinton ordered a change of policy. Nuclear radiation was known to be dangerous and deadly (from the atomic bombings of Hiroshima and Nagasaki in 1945), and the experiments were designed to ascertain the detailed effect of radiation on human health. In Nashville, pregnant women were given radioactive mixtures. In Cincinnati, some 200 patients were irradiated over a period of 15 years. In Chicago, 102 people received injections of strontium and cesium solutions. In Massachusetts, 74 schoolboys were fed oatmeal that contained radioactive substances. In all these cases, the subjects did not know what was going on and did not give informed consent. With the exposure of these experiments in 1993, under the administration of President Bill Clinton. The resulting investigation was undertaken by the Advisory Committee on Human Radiation Experiments, and it uncovered much of the material included in The Plutonium Files. For many years, the AEC provided the most conspicuous example of the benefit of atomic age technologies to biology and medicine. 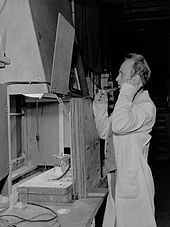 :649–684 Shortly after the Atomic Energy Commission was established, its Division of Biology and Medicine began supporting diverse programs of research in the life sciences, mainly the fields of genetics, physiology, and ecology. Specifically concerning the AEC's relationship with the field of ecology, one of the first approved funding grants went to Eugene Odum in 1951. This grant sought to observe and document the effects of radiation emission on the environment from a recently built nuclear facility on the Savannah River in South Carolina. Odum, a professor at the University of Georgia, initially submitted a proposal requesting annual funding of $267,000, but the AEC rejected the proposal and instead offered to fund a $10,000 project to observe local animal populations and the effects of secondary succession on abandoned farmland around the nuclear plant. In 1961, AEC chairman Glenn T. Seaborg established the Technical Analysis Branch (to be directed by Hal Hollister) to study the long-term biological and ecological effects of nuclear war. Throughout the early 1960s, this group of scientists conducted several studies to determine nuclear weapons' ecological consequences and their implications for human life. As a result, during the 1950s and 1960s, the U.S. government placed emphasis on the development and potential use of "clean" nuclear weapons to mitigate these effects. In later years,[when?] the AEC began providing increased research opportunities to scientists by approving funding for ecological studies at various nuclear testing sites, most notably at Eniwetok, which was part of the Marshall Islands. Through their support of nuclear testing, the AEC gave ecologists a unique opportunity to study the effects of radiation on whole populations and entire ecological systems in the field. Prior to 1954, no one had investigated a complete ecosystem with the intent to measure its overall metabolism, but the AEC provided the means as well as the funding to do so. Ecological development was further spurred by environmental concerns about radioactive waste from nuclear energy and postwar atomic weapons production. In the 1950s, such concerns led the AEC to build a large ecology research group at their Oak Ridge National Laboratory, which was instrumental in the development of radioecology. A wide variety of research efforts in biology and medicine took place under the umbrella of the AEC at national laboratories and at some universities with agency sponsorship and funding. :649–684 As a result of increased funding as well as the increased opportunities given to scientists and the field of ecology in general, a plethora of new techniques were developed which led to rapid growth and expansion of the field as a whole. One of these techniques afforded to ecologists involved the use of radiation, namely in ecological dating and to study the effects of stresses on the environment. The AEC played a role in expanding the field of arctic ecology. From 1959 to 1962, the Commission's interest in this type of research peaked. For the first time, extensive effort was placed by a national agency on funding bio-environmental research in the Arctic. Research took place at Cape Thompson on the northwest coast of Alaska, and was tied to an excavation proposal named Project Chariot. :22 The excavation project was to involve a series of underground nuclear detonations that would create an artificial harbor, consisting of a channel and circular terminal basin, which would fill with water. This would have allowed for enhanced ecological research of the area in conjunction with any nuclear testing that might occur, as it essentially would have created a controlled environment where levels and patterns of radioactive fallout resulting from weapons testing could be measured. :23 The proposal never went through, but it evidenced the AEC's interest in Arctic research and development. The simplicity of biotic compositions and ecological processes in the arctic regions of the globe made ideal locations in which to pursue ecological research, especially since at the time there was minimal human modification of the landscape. :25 All investigations conducted by the AEC produced new data from the Arctic, but few or none of them were supported solely on that basis. :25 While the development of ecology and other sciences was not always the primary objective of the AEC, support was often given to research in these fields indirectly as an extension of their efforts for peaceful applications of nuclear energy. The AEC issued a large number of technical reports through their technical information service and other channels. These had many numbering schemes, often associated with the lab from which the report was issued. AEC report numbers included AEC-AECU (unclassified), AEC-AECD (declassified), AEC-BNL (Brookhaven National Lab), AEC-HASL (Health and Safety Laboratory), AEC-HW (Hanford Works), AEC-IDO (Idaho Operations Office), AEC-LA (Los Alamos), AEC-MDCC (Manhattan District), AEC-TID, and others. Today, these reports can be found in library collections that received government documents, through the National Technical Information Service (NTIS), and through public domain digitization projects such as HathiTrust. ^ "U.S. Department of Energy: Germantown Site History". United States Department of Energy. Retrieved March 13, 2012. ^ Moss, William; Eckhardt, Roger (1995). "The Human Plutonium Injection Experiments" (PDF). Los Alamos Science. Radiation Protection and the Human Radiation Experiments (23): 177–223. Retrieved November 13, 2012. ^ a b Niehoff, Richard (1948). "Organization and Administration of the United States Atomic Energy Commission". Public Administration Review. 8 (2): 91–102. doi:10.2307/972379. JSTOR 972379. ^ a b Hewlett, Richard G. & Oscar E. Anderson (1962). A History of the United States Atomic Energy Commission. University Park: Pennsylvania State University Press. ^ a b c d e f Hagen, Joel Bartholemew (1992). An Entangled Bank: The Origins of Ecosystem Ecology. New Brunswick, N.J.: Rutgers University Press. ^ a b c d e Wolfe, John N (1964). "National Agency Programs and Support of Arctic Biology in the United States: Atomic Energy Commission" (PDF). BioScience. 14 (5): 22–25. doi:10.2307/1293192. JSTOR 1293192. ^ "Atomic Energy Commission". Nuclear Regulatory Commission. Retrieved November 16, 2009. ^ a b Buck, Alice L. (July 1983). A History of the Atomic Energy Commission (PDF). Washington, D.C.: U.S. Department of Energy. ^ Nichols 1987, p. 232. ^ Nichols 1987, p. 299. ^ "Guide to House Records: Chapter 23 Atomic Energy". August 15, 2016. ^ a b Stephanie Cooke (2009). In Mortal Hands: A Cautionary History of the Nuclear Age. Black Inc.
^ a b c Goliszek, Andrew (2003). In The Name of Science. New York: St. Martin's Press. ISBN 978-0-312-30356-3. ^ a b c Seaborg, Glenn Theodore & Benjamin S. Loeb (1993). The Atomic Energy Commission under Nixon: adjusting to troubled times. New York: St. Martin's Press. ^ a b c Hacker, Barton C (1994). Elements of Controversy: The Atomic Energy Commission and Radiation Safety in Nuclear Weapons Testing, 1947–1974. Berkeley, CA: University of California Press. ^ "Farewell ERDA, Hello Energy Department". Energy.gov. ^ a b R.C. Longworth. Injected! Book review:The Plutonium Files: America's Secret Medical Experiments in the Cold War, The Bulletin of the Atomic Scientists, Nov/Dec 1999, 55(6): 58–61. ^ a b Creager, Angela N.H. (2006). "Nuclear Energy in the Service of Biomedicine: The U.S. Atomic Energy Commission's Radioisotope Program, 1946–1950". Journal of the History of Biology. 39 (4): 649–684. doi:10.1007/s10739-006-9108-2. ^ ""Atomic Energy Commission, Studies of Biological Consequences of Nuclear War" 13 December 1961". National Security Archive. August 30, 2017. ^ Hathitrust search for "Atomic Energy Commission". Accessed May 23, 2013. Clarfield, Gerard H., and William M. Wiecek. Nuclear America: military and civilian nuclear power in the United States, 1940–1980 (Harpercollins, 1984). Richard G. Hewlett; Oscar E. Anderson. The New World, 1939–1946. University Park: Pennsylvania State University Press, 1962. Richard G. Hewlett; Francis Duncan. Atomic Shield, 1947–1952. University Park: Pennsylvania State University Press, 1969. Richard G. Hewlett; Jack M. Holl. 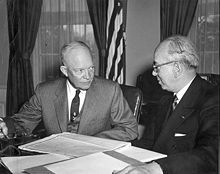 Atoms for Peace and War, 1953–1961: Eisenhower and the Atomic Energy Commission. Berkeley: University of California Press, 1989. Mazuzan, George T., and J. Samuel Walker. Controlling the atom: The beginnings of nuclear regulation, 1946–1962 (Univ of California Press, 1985) online. U.S. Nuclear Regulatory Commission Glossary: "Atomic Energy Commission"
Technicalreports.org: TRAIL—Technical Report Archive and Image Library – historic technical reports from the Atomic Energy Commission (& other Federal agencies) are available here.